This was my first enchilada dish and I have to admit they were a huge hit. I have often been turned off enchiladas because they are often too mushy, drowning in sour cream and excessive cheese. This combination was just right and lightened up without sour cream. Instead I served Greek yogurt on the side. Using bottled salsa verde whizzed up with tons of fresh cilantro in the blender made an easy and quick delicious sauce. Spicing up the meat from a whole rottiserie chicken with cumin, smoked paprika, garlic, chili powder, lime juice and fresh jalapeno made for a light flavorful filing without a lot of work. 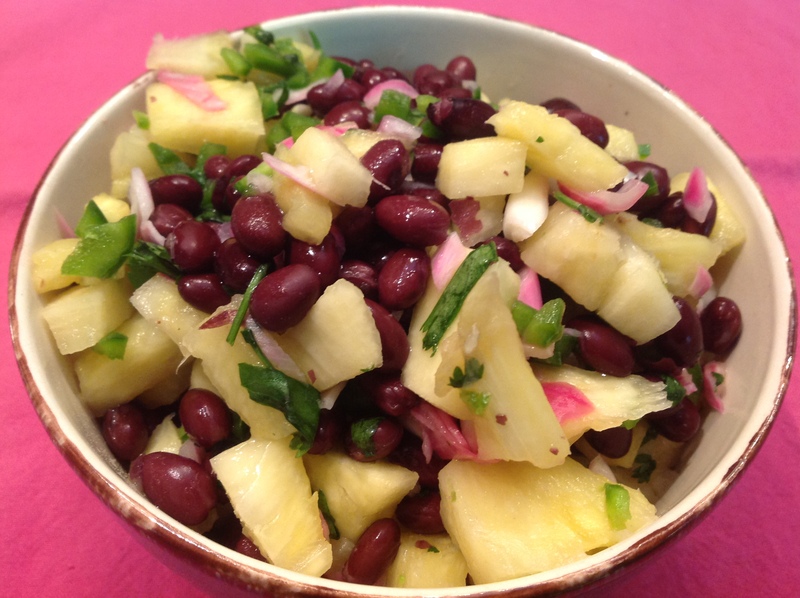 The fresh pineapple salsa with black beans was a fantastic side. I pickled the red onion for a half hour while I prepared the rest of the dish to soften their bite. Although you could use raw onion and skip this step, the pickling turns the onions a pretty pink color and adds some bright notes to the salsa. This meal was a test drive for Cinco de Mayo and made me wonder how I could have deprived my family from such delicious enchiladas for so long. It’s destined to become a favorite. Happy Cinco de Mayo! Toss the shredded chicken with all the ingredients and set aside. In a blender, mix the cilantro and the salsa verde until blended into a smooth sauce. Spread a layer of sauce in the bottom of a 9″ X 13″ oven proof dish. Warm the tortillas as you usually do. I microwaved each one for 20 seconds. Spread about 1/3 of a cup of the chicken filling across the lower third of the tortilla. Roll up and set seam side down on top of the sauce. Repeat until all the tortillas are filled. Spread the rest of the sauce over the enciladas, leaving about an inch of the tortilla uncovered on each edge. Sprinkle with the cheese. Bake 20 minutes uncovered in center of oven until cheese is bubbly. Sprinkle with chopped cilantro and serve with the black bean-pineapple salsa, cubed avocado, extra lime wedges, Greek yogurt or sour cream. Mix all ingredients in a serving bowl. Let the flavors blend together at least a half hour. Can be made up to 3 days in advance. *To pickle the red onion, in an unreactive bowl, mix together 1/2 cup of water, 1/2 cup of white distilled vinegar, a teaspoon of white sugar and 1/2 teaspoon of salt. Mix well and add the diced red onion. Leave to cure about a half hour before adding to the salsa. 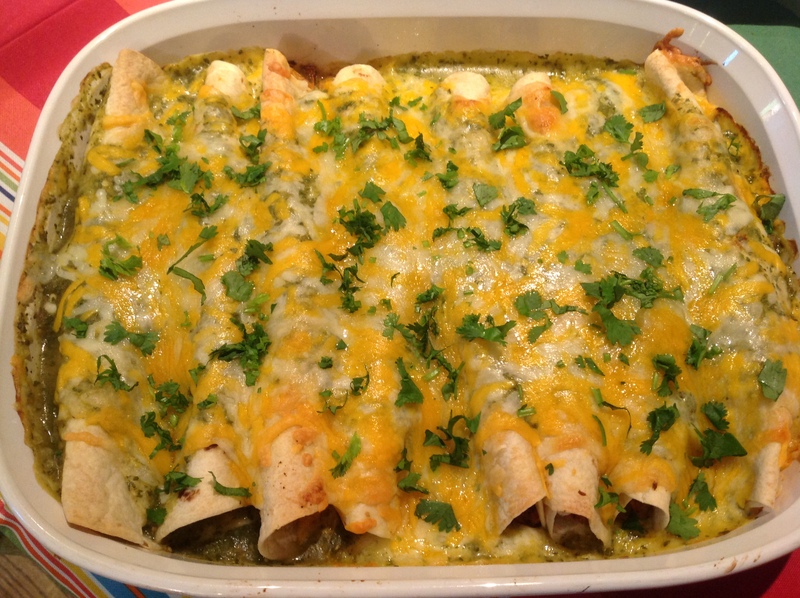 This entry was posted in Recipes and tagged black bean pineapple salsa, Chicken salsa verde enchiladas, rotisserie chicken, salsa verde by Johanne Lamarche. Bookmark the permalink. It all looks and sounds big YUM to me too! Thanks Elaine! Minus the chicken, you would love it too! Green Enchiladas are my absolute FAVORITE type. 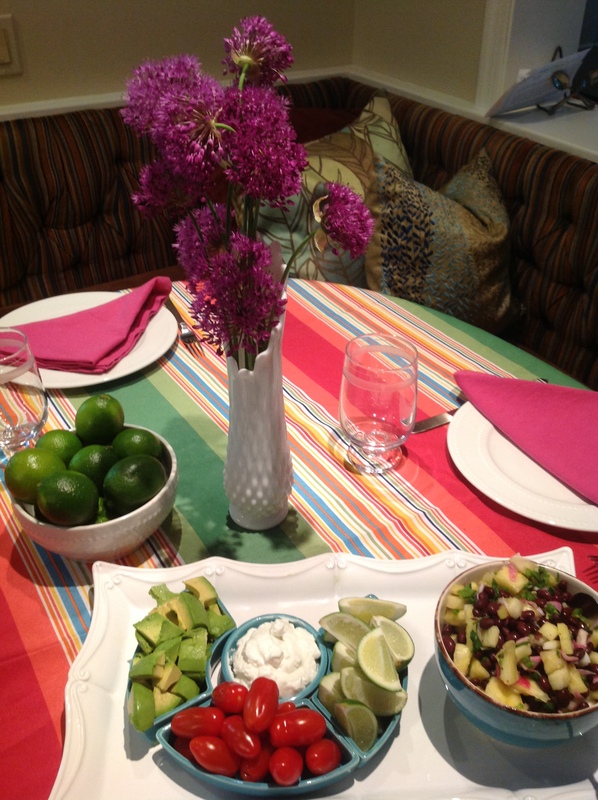 Love your “shortcut” version with rotisserie chicken- and your black bean salsa side. I’m sure it was a crowd-pleaser! 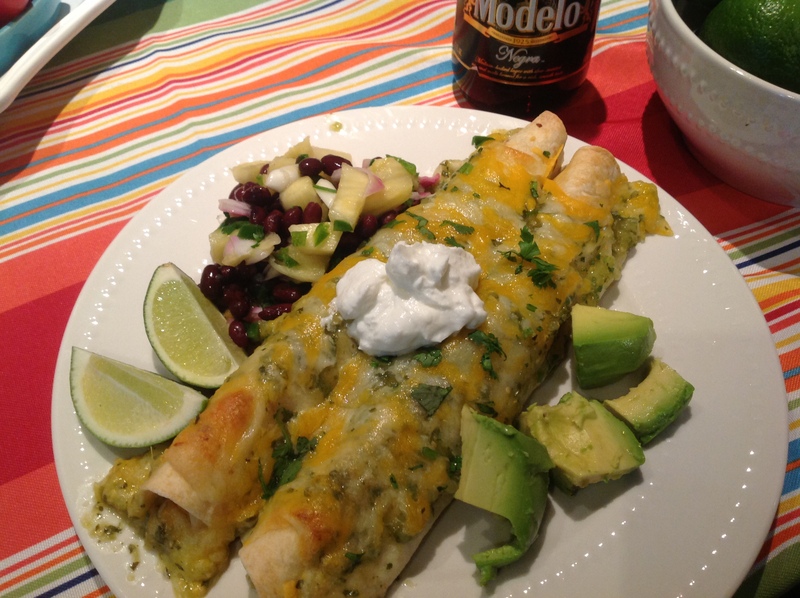 You have been missing out Johanne, so glad you’ve discovered the magic of enchiladas! I don’t like them with sour cream either. Your green sauce sounds delicious and so does the salsa! Ole! These look and sound so good! Funny, but not too long ago I posted my sour cream enchiladas, lol! The folks loved them but I do prefer something like this a lot more!! lol!! And I’ve been at it again!